The component depends on an unregistered concrete type where there exists a registration that uses this concrete type as its implementation. When a component depends on a short-circuited dependency, the application might be wired incorrectly because the flagged component gets a different instance of that concrete type than other components in the application will get. This can result in incorrect behavior. Let the component depend on the abstraction described in the warning message instead of depending directly on the concrete type. If the warning is a false positive and the component (and all other components that depend directly on this concrete type) should indeed get a transient instance of that concrete type, register the concrete type explicitly in the container using the transient lifestyle. Do not ignore these warnings. False positives for this warning are rare and even when they occur, the registration or the application design can always be changed or the concrete type can be registered explicitly in the container. 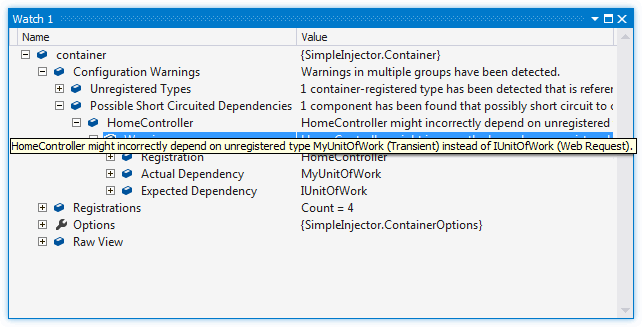 In this example HomeController depends on MyUnitOfWork. MyUnitOfWork however is not registered explicitly, but IUnitOfWork is. Furthermore, IUnitOfWork is registered with a Scoped lifestyle. However, since MyUnitOfWork is a concrete unregistered type, the container will create it on your behalf with the Transient lifestyle. This will typically be a problem because, during a request, the HomeController will get a different instance than other types that depend on IUnitOfWork while the intended use of IUnitOfWork is to have a single instance per web request. For Unit of Work implementations this is typically a problem; the unit of work defines an atomic operation and creating multiple instances of such a unit of work in a single web request means that the work is split up in multiple (database) transactions (breaking consistency) or could result in part of the work not being committed at all. The MyUnitOfWork type is called ‘short circuited’ because HomeController skips the IUnitOfWork dependency and directly depends on MyUnitOfWork. In other words, HomeController short circuits to MyUnitOfWork.